A sample family reunion invitation can be all you need to spur your creative thoughts and put on the event of a lifetime. You want your family reunion to be something that people will remember and cherish for their lives. These invitations for family reunions can help set that stage. 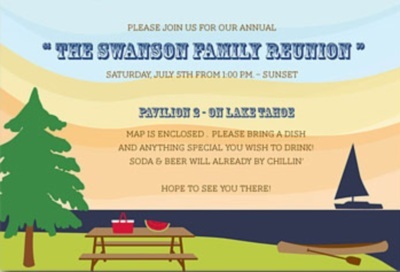 When it comes to a great family reunion invitation, it needs to have the basic information (when, where, any other details) and also a theme. The theme allows people to plan what to bring, but it also helps you plan the activities for the party. I really like this sample family reunion invitation because it has all of the key elements. It tells you what family is having the reunion, where the location is going to be, when, and what to bring if anything. It also has the classic outdoor theme that many people will enjoy and relate with. When it comes to manners and etiquette of the family reunion invitations, it is not only about the invite itself. It is also about knowing who to invite. First of all, you must know how much space there is at the location. I know some places do not have enough space or accommodations for the entire family. In a case like this, you may have to break it down and invite only certain branches of the family to make it work out. Another frequent issue about family reunion invitations is if a friend should be invited to participate. The general rule of thumb is that friends should not be invited. The only exception to this is if they are a long-time friend of the family and they have already met the majority of the family prior to the event. Think about it this way: if that person was introduced to other people at the party as a friend, what will they think? The family members will wonder why a friend was invited to the party. It just seems out of place and like it doesn't belong. Neighbors are also generally a no no. Again, the only exception here is if they are also a connection that knows the majority of the family before the reunion. These simple tips on family reunions should help you get the most of the experience and provide an opportunity to grow closer as a family.